China’s largest ride-sharing operator, Didi Chuxing, has announced a new joint venture with Beijing Electric Vehicle Co., an affiliate of BAIC and China’s largest EV maker. 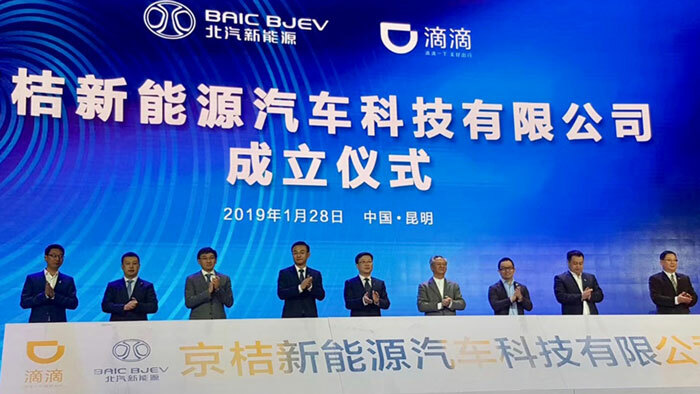 The joint venture, called BAIC-Xiaoju New Energy Auto Technology Co. Ltd or JingJu aims to combine their strengths in new energy fleet operation and AI (artificial intelligence) transportation solutions to develop next-generation connected-car systems. China has aggressively pushed for so-called “new energy vehicles” to help to curb air pollution. The China Association of Automobile Manufacturers has forecasted that new energy vehicle sales will reach 1.6 million units in 2019. With the support of China’s policymakers, the country is accelerating its systematic transition to new energy vehicles. BAIC has announced plans to stop the manufacturing and sale of gas-driven car models by 2025. Today, close to 400,000 new energy vehicles are registered with DiDi in the world’s largest shared EV network, many through the company’s partnerships with leading EV manufacturers including BYD. Jingju is a key component of a DiDi-BAIC strategic partnership formed in a growing alliance between DiDi and auto-industry players. DiDi started partnership programs with automakers and fleet operators in 2016, and launched the DiDi Auto Alliance, an industry-chain partnership network in April 2018. Xiaoju Automobile Solution (XAS) was soon created to build a collaborative driver/car-owner service platform through integrated auto-finance, leasing, trading, charging and refueling, and maintenance operations. To build a sustainable and more robust shared mobility ecosystem, XAS is also attracting OEMs, dealers and independent fleet operators to put their fleets on DiDi’s open car-sharing program to share DiDi’s scale of operation, service standards and data capabilities. XAS now serves drivers/car-owners on DiDi and beyond through the main DiDi app and a separate XAS app.